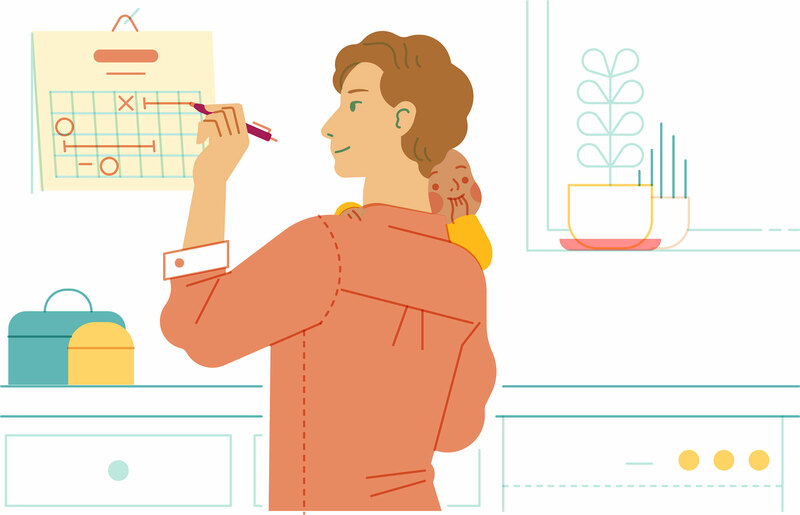 Airbnb’s Design Language System (DLS) contributes to an accessible, inclusive design practice for our user experience—from typefaces and color to illustration and motion design. Click here to learn more. Words can set the tone for a company, but it’s the pictures that give it a face. Illustration has yet to find its place in the tech world, because it’s often unconsidered and thrown in on the fly. Whether being used to distill complex messages or add a touch of whimsy, illustration is one piece that makes up a company’s visual brand identity. With nearly a decade-long career as an illustrator in Silicon Valley, I’m just now seeing illustration pique interest in the tech industry. Companies are starting to understand its value—that the images can inform and delight their audience. But despite illustration’s growing popularity, it’s not universally considered a distinct discipline. Companies look to designers who like to draw, engineers who can doodle, or freelancers with a barebones design brief. Illustration hasn’t received the same time and resources as other crafts. One of my career goals is to elevate the quality of illustration in tech. Airbnb’s design brand is a harmony of many disciplines—a chorus of experience and motion design, photography, writing, data visualization, and illustration. 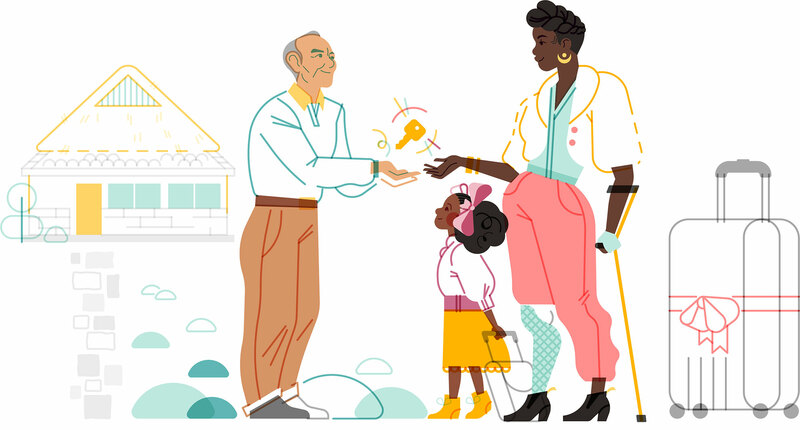 When I joined the team in October of 2017, I was given the opportunity to redesign Airbnb’s illustration style as a key component of our core identity system. Here’s how my journey unfolded. My first step was research. I gathered all illustrations from Airbnb’s past and talked to the people who either witnessed or were a part of their development. I learned there were a few standalone illustrations created for a one-off presentation that employees later adopted. Other designers incorporated their personal styles, merged with our brand mark, and handed the work off to the production design team and freelance illustrators. One thing became clear in my research: no one had ever stepped back and thought of illustration as a major reflection of the Airbnb community. 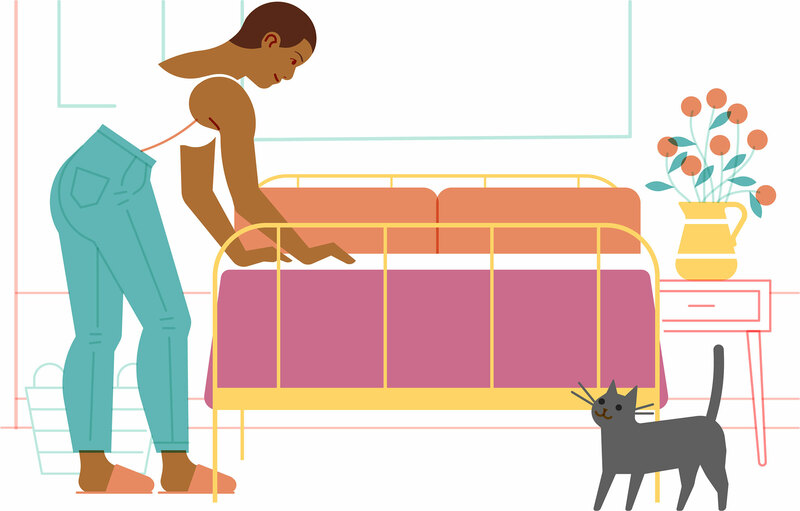 It was time to pull Airbnb’s illustration style out of its awkward teenage phase. The most insightful part of my research phase was gathering opinions from my coworkers. Many of the critiques called for a less bubbly aesthetic, but there was one key insight from my Black, Asian, Latinx, and Middle Eastern coworkers that struck me: “It doesn’t represent me.” Their thoughts resonated deeply—they reflect my experience as an Asian American woman who grew up not seeing myself reflected in the world. It’s easy to get wrapped up in the legacy style of tech illustration—cartoon people outlined in blue or grey. 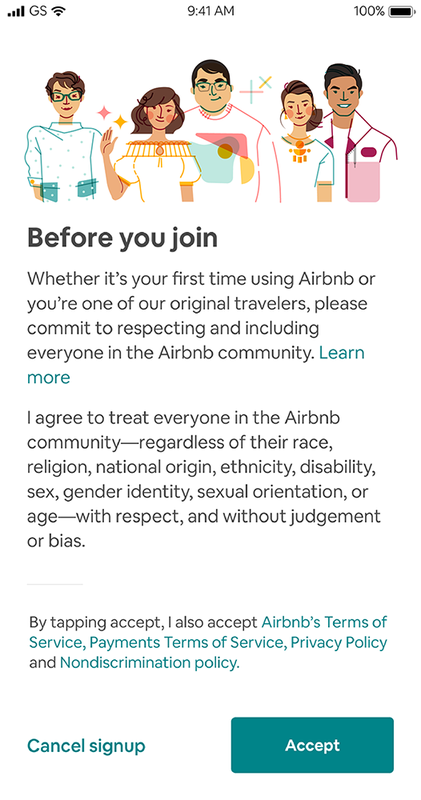 This lack of representation doesn’t reflect Airbnb’s commitment to inclusivity. Airbnb hosts, guests, and employees represent all corners of the globe—from a grandmother in Chengdu and entrepreneur in San Francisco, to empty-nesters in Istanbul and a wedding planner in Nairobi. The opportunity to do right by my coworkers and the communities we serve was clear. 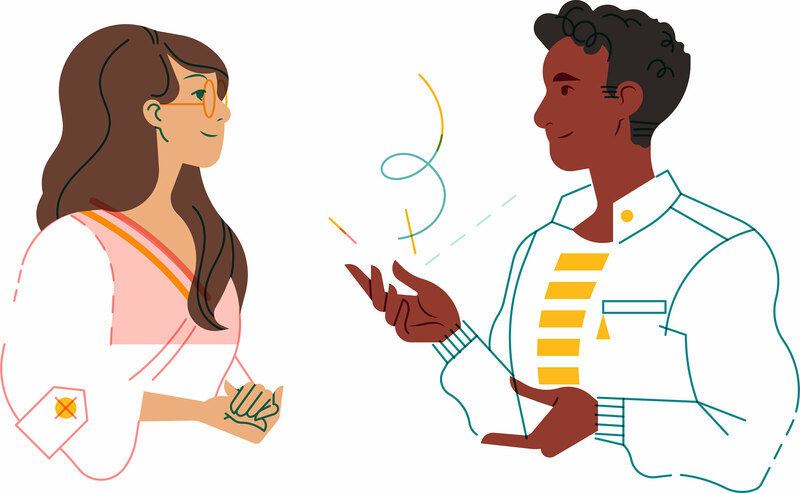 Our illustrations are guided by four principles—they’re grounded, scalable, lightweight, and diverse. We made the illustrations more grounded by moving away from a bubbly, childlike style. And like the rest of our design language system, their style is fairly minimal and lightweight. Intentional white space brings a nice balance so illustrations don’t take away from the context they’re in. It’s also important that they scale across places, platforms, and devices at many different sizes. 1. Embrace differences. Accurately represent different races, ages, abilities, and body types. 2. Keep it real. Cast characters who aren’t all white men, and reference photos for every person drawn. 3. Reflect everyone. Consider all types of diversity, including the disability community who makes up 15% of the world’s population. Western-centric, outlined cartoon people need to change. Diversity of age, race, disability, religion, orientation, and gender are the foundation of who we are. We need to reflect belonging anywhere, and my role was a clear opportunity to celebrate diverse identities. Throughout my career, I’ve heard many heated debates around “body politics”—the right skin color, best body type, and most appropriate gender. This gave me a deep-seeded insecurity, and brought fear to the forefront of my attention. I’ve also experienced drawing everyone in various shades of grey to avoid the question of race altogether. I was afraid to stray from a “default” human aesthetic. And as I look at the landscape and history of illustration in tech, I see that the debate is still alive and well. A solution that many land on is a kind of homage—a metaphor for diversity through rainbow-colored figures. They’re often the same body type and age, but colored in red, blue, yellow, orange, purple, and green. Put simply, they’re not real. And while this may be fine in a world that’s just starting the tricky conversation about representation (I actually tried this approach in my initial Airbnb drafts), I knew it wasn’t right for us. We could do better. 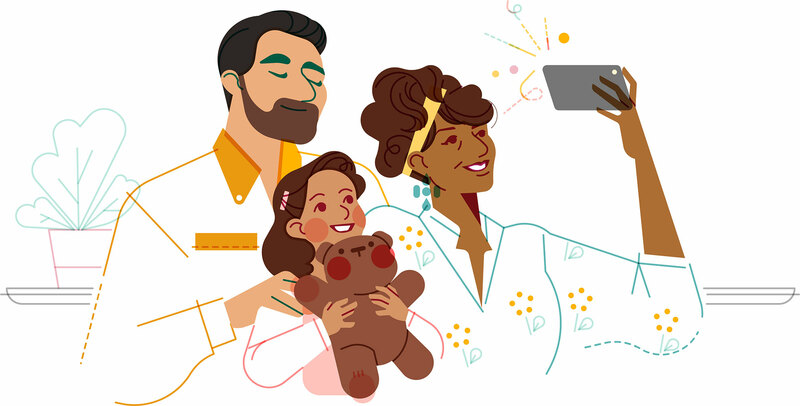 Our mission is to connect people across cultures and continents, so our illustrations have to reflect the community we’re bringing together. We can’t generalize or curate based on what’s considered most “commercially acceptable”. Instead, we need to be radically honest. Humans are humans, so we don’t try to design our way around the simple fact that we’re all different. We want to celebrate the global Airbnb community with respect and care. 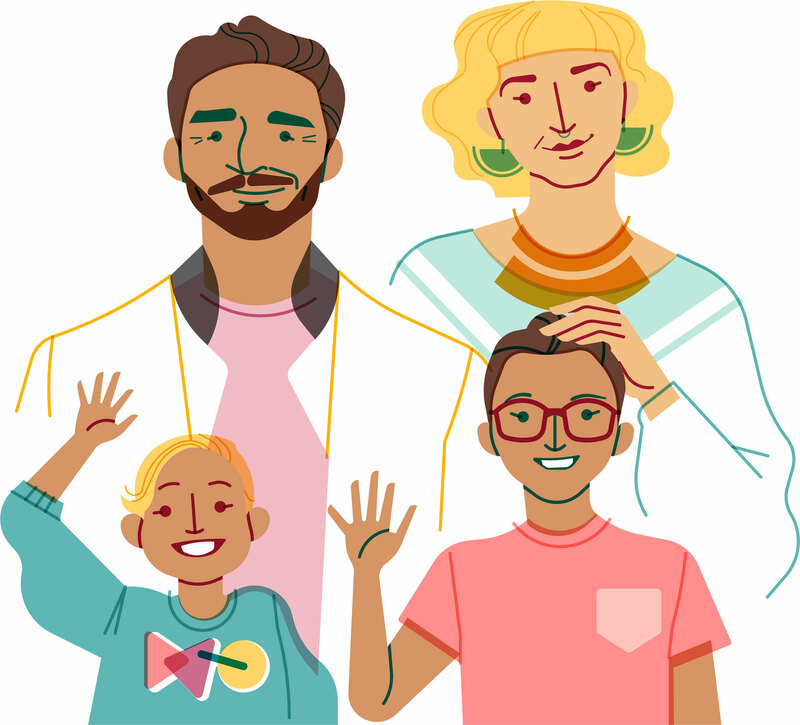 By referencing real photos of our hosts and guests, historical figures, friends, families, and coworkers, we’re able to represent the people in our product with as much diversity as we see in the world. Using real photos for inspiration accomplishes two things: it ensures authenticity when we depict diversity because it leaves no room for the artist to generalize or stereotype, and it stops the artist from drawing endless variations of their own face. Illustrators tend to draw what they see most often. I know my face is the one I’ve seen the most throughout my life, but I’d be horrified if every character in our product was a version of me. Something critical to our style is the inclusion of people living with disabilities, whose identities intersect with gender, race, nationality, orientation, and age. Michael Austin Sui, an Inclusive Design Lead who specializes in accessibility, is my closest partner in getting this right. By partnering with Airbnb’s employee resource group for people living with disabilities, we’re able to discuss work in progress and get direct feedback about their lived experiences. There are many things I’ve personally learned while building our illustration library. For example, there’s an ongoing debate within the deaf and hard of hearing community about cochlear implants. Some people use them in illustrations, while others prefer the depiction of sign language. We want to incorporate both in our product. The depictions of visual disabilities are relatively direct, such as a prosthetic limb. But invisible disabilities aren’t as straightforward. 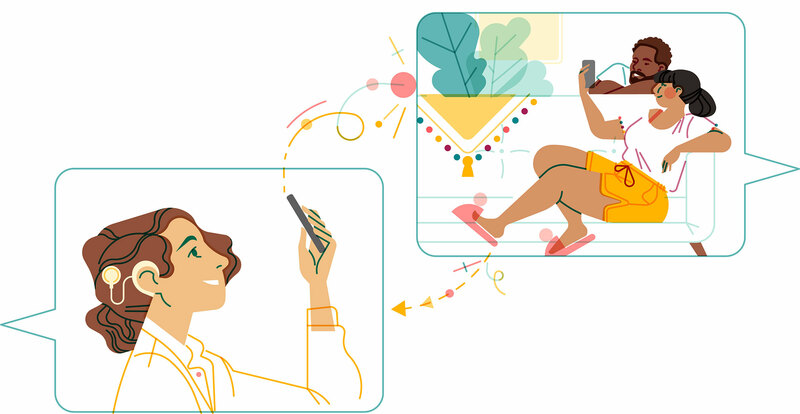 I’m learning from an Airbnb employee who identifies as Autistic how we could incorporate visual cues, like specific arm gestures or sound cancellation devices, so illustrations reflect more neurodiversity. I have a limited understanding of the vast array of disabilities, and this is admittedly a learning process for me. As we continue to connect with the communities themselves, we’ll expand our knowledge and skill sets so we can get it right by being more inclusive. 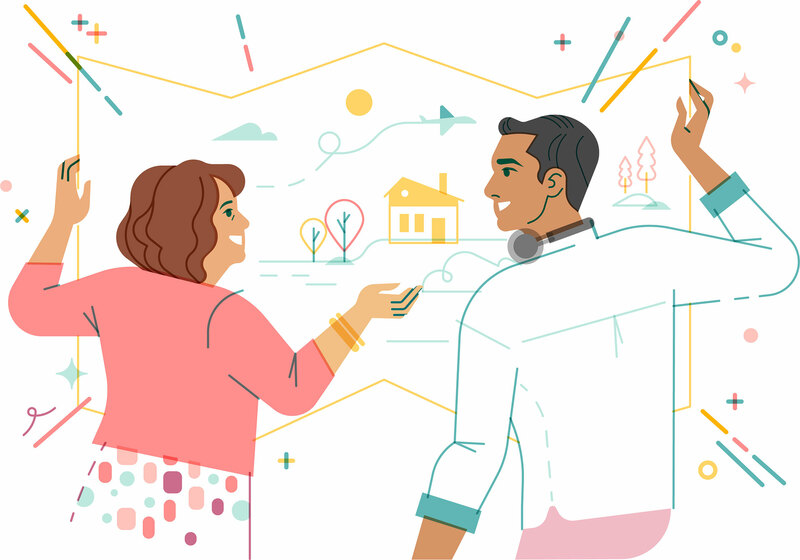 As our new illustration style reshapes a piece of Airbnb’s identity, we hope to shatter the status quo. We don’t want to perpetuate the narrative that many of us grew up with and still experience—that what makes a human valuable is being a western male. By pushing past the default human identity, we naturally need our team to reflect our external image. 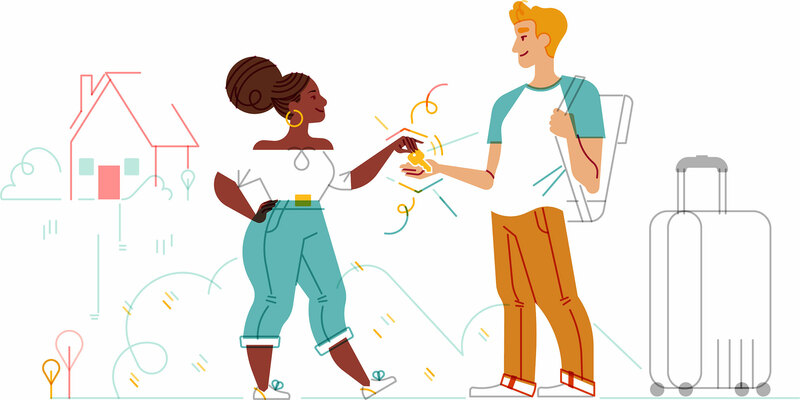 Our aim is to broaden our worldview, uplevel our authenticity, and continue building trust with our global community, and we can do this by building an illustration team that sings Airbnb’s mission of belonging. “Normal” is diverse. My goal is to move the needle of representation in tech, but it’s not a responsibility I or Airbnb can carry alone. The tech community must consider the fabric of who makes up their companies, and how that identity is presented to the world. It’s time to be radically honest about our differences. Jennifer Hom is the Experience Design Manager of Product Illustration at Airbnb. She regularly pretends to be a serious business woman, but is actually an anime nerd.